I have been getting to know my local Bigfoot hunter group. They are really nice group of outdoorsy guys, a little shy, and 2 of the group have seen what they feel is a Bigfoot. They are nice enough to let me be the skeptic “on call”. The group (with no real official name) decided to try something new this winter. They call it “Snow Scanning”. They asked various local families with acreage to go out everyday and look for unusual footprints in the snow. I signed on, since one of the supposed Bigfoot has been seen in the area where I live. I have learned I have a very active fox population (no big surprise as I see them often, they are quite unafraid of my family and my dog). I also found what might be a hybernating or dead bear. Spring will supply the answer. 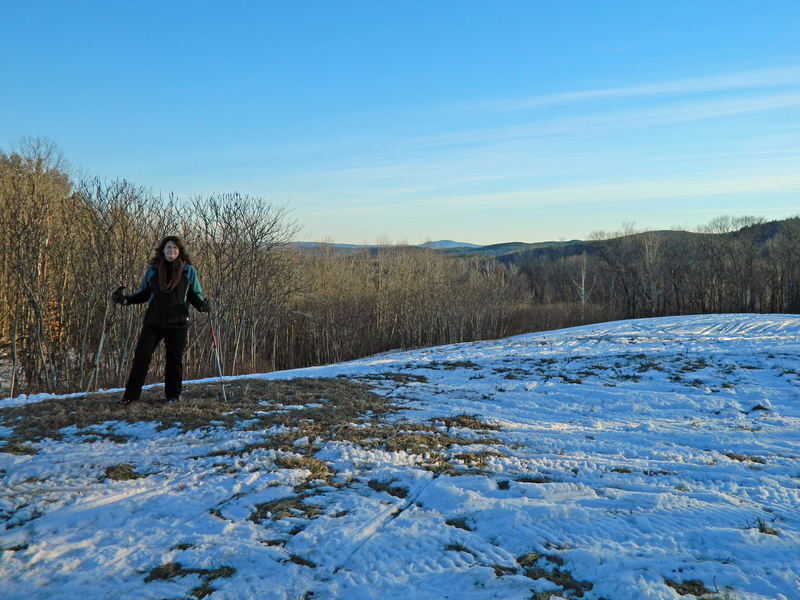 I also volunteered to help by taking a turn walking along the trails of Pisgah State Park to look for unusual tracks. The instructions I was given was to stay on the more remote paths, and look for tracks in the snow that are far in the woods. The local group feels Bigfoot would avoid a trail or path, so to look for tracks that do not come from any trail. I was also told to look for big tracks, not small. I have to say that animals do tend to use the paths. 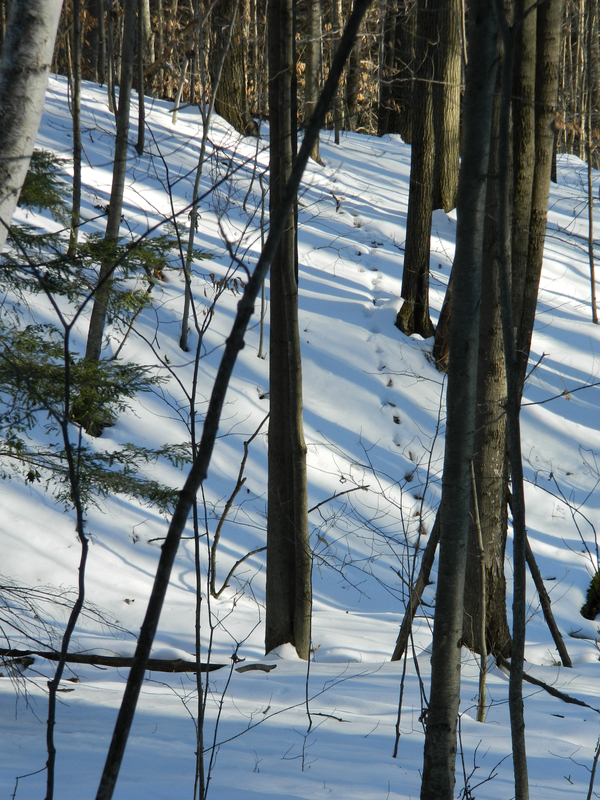 As I walked along some of the more remote trails I saw deer and fox prints on the trail. 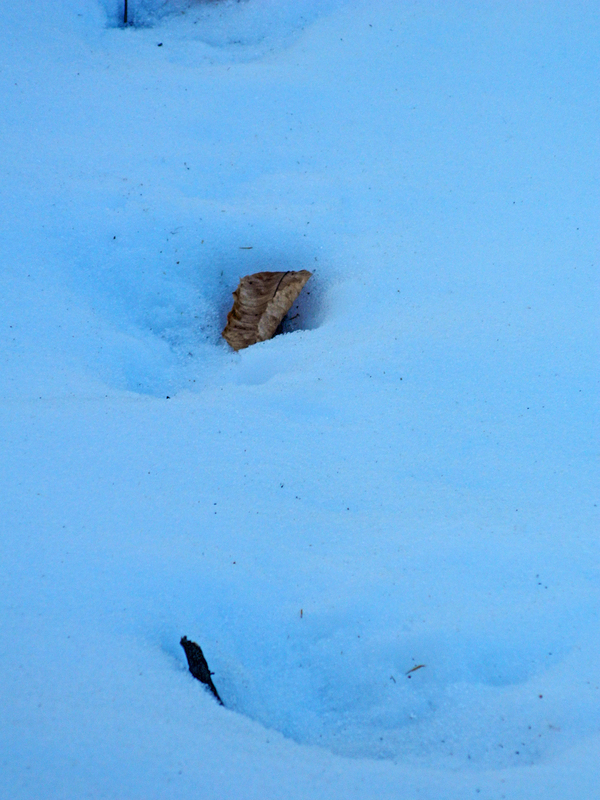 Bigfoot would have a much easier time using a trail rather than tromping through the deep unpacked snow. I was pleased to see, far from me across a stream, a set of large snowprints! They seem very close together, not a large Bigfoot type stride. These were larger prints than I usually see, and they did not begin or end near the trail I was on. There was no connection to any trail that I could see. I marked the nearest tree with a bright color blaze, and called in the site. (If I had a GPS I could also have used that). Big animal prints, not what I’m used to seeing, but a small stride. A member of the team will be out the next day to follow the tracks and measure and photograph them. It was too far, and too dangerous with a half frozen stream to cross and to get a measurement on the size of the prints. However, some of the prints did have leaves in them, so that would give some size estimate. I also know that the sun and melting can play havoc with snow prints, but it is still fun to be part of a project like this. I think as a skeptic, it shows the less skeptic, I’m willing to help them gather evidence. The more I listen to the Bigfoot group, the more they listen to me in return. These are small animal prints, not Bigfoot ! So far the group has had only a few unusually large snow prints reported. I’m excited that my prints are included in that group. However, the winter is young and hopes are high for more prints to be found. 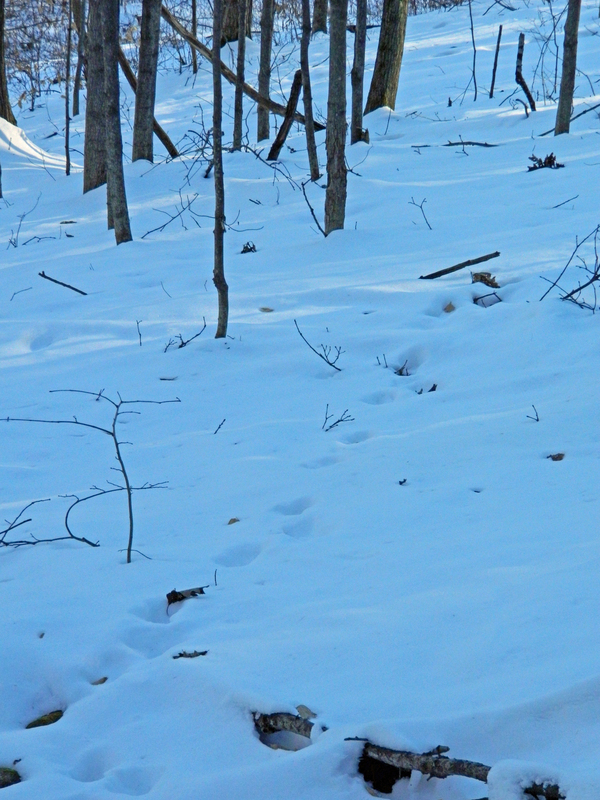 While a snowprint does not have the detail of a footprint in mud, if Bigfoot is indeed wandering around the woods of New Hampshire there should be thousands of prints now that the entire forest is covered with a blanket of snow. I’m a skeptic, the local group is not, but we can work together and learn from each other as we both participate in “snow scanning”. Now WHY in the world would anyone familiar with Animals and who studies fauna in the wild ever say that BigFoot would NOT use a trail. When in fact it is a proven fact that ALL animals tend to use trails in the wild to travel. ALL animals prefer the ease in trail travel over romping through the forest over downed trees and through brush. Big animals are no different but squirrels and rabbits even use trails. LOL It is BULLCRAP to say BigFoot would NOT use trails. I suppose they would argue that the trails have human scent… but I think they would prefer to make life easier as do Moose and Bear. 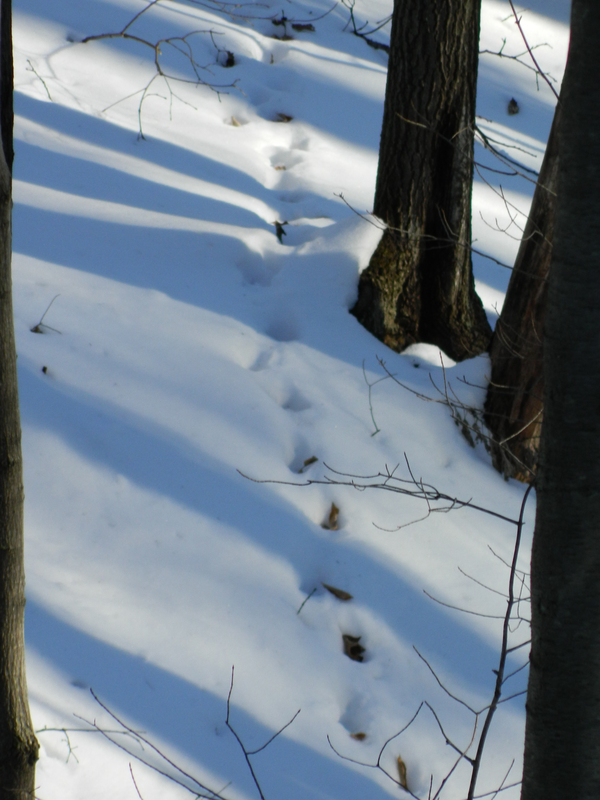 Deer even create trails and other animals use the Deer paths to travel its not just human trails that animals use. I agree. I saw so many animal tracks on the more remote paths. I’m talking paths only big enough for hikers, and too rough for X country skiers and snow mobiles. Really remote. All the animals seemed to be using the paths! Now I did see those weird prints that went to the stream, and did not return …whatever it was followed the stream (or come out of the stream). But other than getting a drink, I see no reason any animal in winter would use the stream for travelling. That was ODD, but it doesn’t mean BIGFOOT! That study is not really published and many science groups are calling shenanigans. The following reasons being that no data is available. It’s being published in a rather dubious journal which if I am not mistaken was bought by the researcher. Also no actual evidence or even the study itself has been published so people can read what they did and how it was conducted. http://doubtfulnews.com/2012/12/dna-experts-view-of-the-ketchum-bigfoot-dna-claim/ the scientist is such an expert on this article it would probably be impossible not to include him in a peer group to review the study. So unpublished and not reviewed and dubious journal makes me think its hokum. Lol it’s ok Bigfoot experts won’t accept that this study isn’t accepted anyway. Many researchers in DNA state that it is very easy to have human DNA contaminated because depending what was actually used as Bigfoot DNA it could have been handled so much that everyone’s DNA is on it. So we shall see if this study sees the light of day or not. Just keep up with legit sources for info. Not Bigfoot websites. Well if Bigfoot people want to leave the world of cryptozoology they need footage on video much like Jane Goodall in some habitat where a family of big foots are living. It makes no sense to pretend this one supposed hominid lives solo. I’ve never seen any grainy footage of a group when all monkeys and apes are social groups and to survive ss a species even the panda can be found in the wild. It just blows my mind that people believe in these creatures based on evidence that was provided years ago by people who admitted they were playing a joke. The one video provided has been studied like the zapruder film. Real science demands more and people who make amazing claims need to provide amazing evidence. The DNA study I feel will fall away as just crappy science. The group doing the study aren’t even DNA scientists but rather forensic scientists lol. Oh well I say bring me a body and then were set!